I need one of those. – Dirty wet dog , boats and sailing. It’s obvious to me that during my down-time i have been spending far too much time on the internet, and in my head, and not enough time out in the shed. My original intention for my knee-op recovery period was to take the first month pretty easy, just do the prescribed exercise, do a bit of writing and then get really active after that. I thought that by a month in i would be good-to-go on practical work : maybe not on the boat but at least in the shed. Well, it was hopelessly over-optimistic as i couldn’t stand for long , wasn’t stable and my back seemed to hate me. It was a lot rougher recovery than i expected and it’s only after about 10 weeks that i have been able to do much useful around the place. When i did finally get in the workshop the chaos fairy had been at work again and i could hardly even see the floor let alone the workbench. A few weeks ago when i was working up a training and rehab plan to get me back to work i realised that i needed some kind of physical activity that would mimic being back at work. 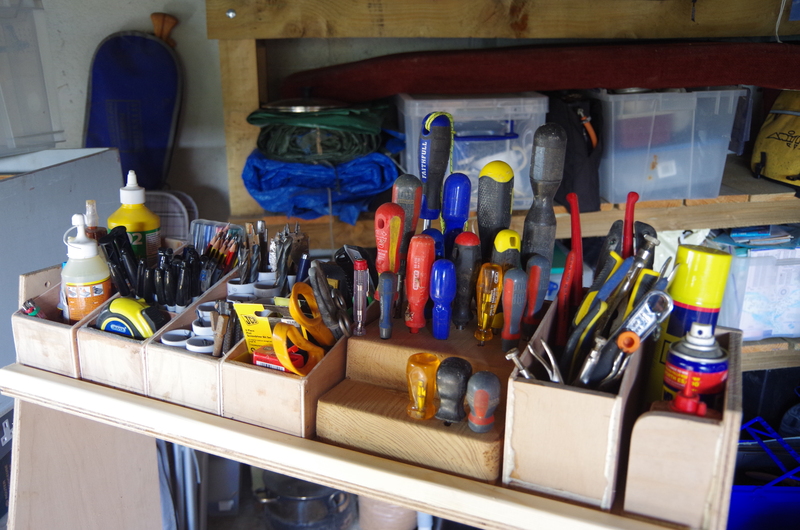 I couldn’t get aboard the boat so i thought the best thing to do was get in the workshop and start to sort out the mess….again and then set-to with some practical projects. Now, i don’t know whether you guys remember but a few months back i built a very rough tool-board in an attempt to get my commonly used tools off the bench and into some degree of order. Well it worked to some extent but the main problems with the clutter on the bench didn’t really change so i took another look at the problem. After 2 sessions just tidying up in there and looking at the bench on a daily basis all week i realised that what i needed was a much better solution to tool storage because i only do some work inside on the high bench and in fact do the bigger stuff outside on the old garden bench outside the shop that i use as my big-board cutting bench. Really, i need all of my main tools and things like drill bits, fastenings, glues and so on to be on a rolling stand so that i can have everything next to me where i am working. I do also need to put a new worktop on the inside bench, add a new vice to that and then resurface the bench i use outside. While i am at it i wouldn’t mind building a lean-to/carport to extend the dry working area but to be honest i really ought to re-roof the workshop first and lay a new floor with some pretence of being level…….however , to be honest, the whole thing needs rebuilding. And yes : that is a sea toilet sitting on the second bench. My daily entertainment after doing some work on the blog and posting on the facebook sailing group has been to watch a bit of the Adam Savage/Tested youtube video’s. I hadn’t heard of the guy until this extended time off but he seems to be a film producer, former actor and now ‘maker’ who likes to spend his spare time replicating film props and just having fun making all sorts of model-geek stuff. His workshop is pretty amazing too and what got me going on my latest project was his take on a rolling tool stand , and that’s where the “i need one of those” came from. From Adam Savage to Simone Giertz and then Laura Kampf i have suddenly found a whole bunch of slightly bonkers people that just like making stuff….i like making stuff, it’s just that i don’t know what i am doing and they do ! The obvious thing to do was get back in the workshop to see what scrap ply is lying around in the workshop and just see what i can come up with. Al…this bloke has got more tools than even you have ! Rather than spending days thinking about it i just got in there, found some suitable pieces of ply and quite literally started throwing the first version together. I knew from the outset with this one that what i wouldn’t be making was anything like the final version but i just wanted to have something like a structure to start playing with and from there working out what i actually want to build. This isn’t much ‘design and build’ , rather it’s ‘throw something together and see what we can learn from it’. If the first version works for a while and teaches me something then i will be a happy-camper. So, enter test-bed one mark one and just about everything except the idea is still wrong. At the end of day 1 the basic box/carcass is on wheels and i started adding a simple divider system at the top for the small fussy stuff that i always lose outside. At this stage the base is a piece of 1″ ply left over from the bathroom floor and the sides 1/2″ from the bathroom walls. I suspect that the sides might be too floppy when there is a lot of weight high up and when i get around to building mark 2 i will probably use 18mm ply for the sides rebated into the base, at the moment the whole construction is simple glue and screw with my new discovery which is ‘Gorilla’ glue……PVC glue i think. First look at the basic box. First go at the top with built-in dividers and a block on the end which was going to be drilled out for screwdrivers. The first mistake was to buy some plain casters, i should explain that my workshop floor is on 3 levels (levels is the wrong word here as it suggests flat-ness) and the section it will have to roll on is very rough cobbles so it needs not only large casters but braked ones as well. Trying to hold it still while adding detail was almost impossible. I know that it’s supposed to be a rolling rack but it’s not supposed to go rolling off down the drive ! It’s also too wide but not deep enough for one major toolbox that has to go on there and what i initially rejected from Savages design, the side cut-outs might in fact be vital. The next thing i realised is that i might want to start first with some small modular boxes that will hold the very things that need sorting….all the drill bits for example so stage 2 was to build a few of those first and see how they worked out. After that i also worked out that i want the tool rack to carry 2 or 3 of the Stanley brand sorting boxes so that i can always have a selection of the basic screws and other fastenings that i use all the time. Stage 2 and ‘enter the modules’. The 4 on the right are just simple plywood boxes glued and pinned together made from 12mm ply base and ends with 5mm sides. The screwdriver module is made from 2 chunky pieces of Douglas fir glued together. The first one i made using epoxy fillets which i quickly realised was stupid because they took hours to cure : the subsequent ones are just glued and pinned together with ‘Gorilla’ glue. With the top completely taken apart again i started again by making the first 4 modular boxes , from the left in this picture, they are the : glue box, pens/pencils/markers box, drill bits module and ‘bits’ box (driver bits and blades). The drill bits module is the same sized box as the other 3 in the group but it uses 40mm pvc pipe to hold the different sized bits. With the modules in it looked a whole heap better so inspired by that i made the screwdriver module, the grippy-tools box and had a space at the end for a the WD40 and oil can. The top doesn’t quite have enough space for another box at the right hand end but i can correct that next time. It looks a lot better, it’s a lot more organised as stuff is now grouped together and i like it a lot more. The second problem that the new top creates though is that at this stage it’s very top heavy and is easy to push over in the front to back plane although at this stage it had nothing low down for ballast. The obvious solution was to add a couple of spreader plates at the base to widen (deepen) the footprint. Stage 3, working on the base boxes and modules. First look, dry fit of a box for my regularly used power tools and a section to hold a Stanley organiser. Messing around with tools and layout. This adds more useful weight at the base but needs more organisation….base modules needed. The workshop is still a total tip at this point and as soon as i clear a section of bench to work on i throw more tools on it to make storage for. End of day, looks promising with space for just one organiser box and then simple boxes for the lightweight stuff. In the next iteration it would make more sense to allow space for 2 or 3 of the organisers. Looking at this the next morning i realised that although it was starting to look functional at the bottom , even quite neat, that the first base module, the sandpaper rolls box and it’s twin (tapes box) although a good size, might be better higher up as they are comparitively light so could and should go higher up. That would leave space for the small clamps box and a wide/flat box to take packs of common fasteners. So far it’s all been made from scrap materials left over after the bathroom project except for the white piece of plywood that came off one of the ex boats and the casters which i had to buy. Just one discovery at this stage is that working with ‘gorilla’ glue and a handful of pins is a lot faster and easier than mixing epoxy and trying to do tape and fillet joints in a cool (cold) and damp workshop. Now iv’e only got to build the main tools storage , clamps rack , add the base spreaders to widen the footprint etc etc….fun though. In part 2 of the build i’m going to finish the work and if all goes well do a quick video of the finished job to try out my new camera on. Gorilla glue and pins FTW. I enjoyed the video too. Thanks Steve. OK, so putting the joking aside, I am interested to learn your views on the use of Gorilla glue. I am guessing that you used the clear wood version, as there appears to be many types under this brand. I’m pretty new to using it, in fact i have only used it for the one project so far. The bloke that turned me on to it was boatbuilder Nick Gates who uses a different make of the same glue nearly all the time. His version/s though have different cure times from a very fast 5 minutes up to beyond an hour. The Gorilla brand version i am using has a setting time of around half an hour. The advantage for my workshop is that it’s a cool (often cold) place and often slightly damp in there so epoxy is a real problem. To use epoxy properly i have to bring everything inside for up to a week to ensure the wood is completely dry and even then build an ‘oven’ or curing box around the work. Last year when i built the wanigan i cured that in the greenhouse ! The opposite situation is that the Gorilla PVC glue relies on moisture in the wood to start it’s cure, in fact in some jobs there is a recommendation to damp the wood first. I haven’t done a big boat job with it yet….if i build horizontal sprits for WABI”’ i’m not sure now which glue i will use. I am tempted to use PVC instead of Epo as it’s much easier to work with except that it doesn’t have the same gap filling property as epoxy plus fillers. So far it does seem to be a viable strong glue given that i am mainly edge glueing plywood and that’s one of the settings where epoxy normally wins. Obviously it’s a ‘tube’ glue….no mixing involved which makes it much more convenient to use….no estimating quantity and having to make a second batch or making too much. So far so good and for my current projects i am happy with it. For boat jobs i might get try some different brands. I looked at what our man Nick was using and can’t remember the brand name. I think ‘Balcotan’ is the same stuff and maybe some of the Titebond brand. Advantage here is that my local hardware store keep Gorilla. Their repair tape is very good BTW. Good read again. Inspiring for a lazy sod, but l just use stacking parts bins. grouped like yours, grippy stuff, screwdrivers, allen keys, sharp stuff etc. Ditto my fastener selection, s/s, brass, woodscrews , self tapping, bolts etc by size. Anyhoo, glue. Finding the Gorilla foaming a bit much in our humidity but really strong. Have not touched my last gallon of West, now a Titebond guy. New cuddy top on my woodie beach cruiser. Titebond, canvas and paint. Easy, clean and oh so non toxic. Even looks trad and ok. Ditto my mini tug conversion of a Stevenson Pocket Cruiser. Our group, Can-Am dinghy cruising assoc, is split in two camps. Epoxy, marine ply, hardwoods or fglass, s/s or brass screws, my old style. Now l am over 70 and even lazier, l joined the dark side. Lumberyard ACX ply, Titebond ll or lll, drywall, zinc screws and good porch paints. Easier, way way cheaper and will out last me, there again our parrot will and maybe the dog. He is not dirty or wet now, too cold here.